Welcome to November. Wool season. Make sure your speakers get the memo. 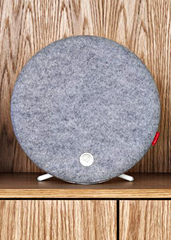 Open your ears to the Libratone Loop, a circular wool-covered speaker that hails from Copenhagen and plays music well. Really well. Available online now. Let’s not make this complicated. It’s a speaker. It’s from Denmark. You sync it wirelessly with your smartphone or computer and then you bask in the auditory bliss that only 120 watts of Jethro Tull (or... something not Jethro Tull) can provide. Oh, and about that soft wool the speaker comes wrapped in: it’s Italian and it’s available in interchangeable colors (think gray, red or black). Yup. Outfits for your speaker.